Image: the cave is the ruin of a much bigger cave which is collapsed. Location: Between Ερμιονίδα (Ermionida) and Κοιλάδα (Kilada) at the coast. Follow the road from Ligourio to Port Cheli. A few hundred meter after the town Fourni there is a turnoff to the right to Παραλία Φούρνων (Paralia Fournon). Follow this road straight to the west to the beach. Park car and walk to the left, at the end of the beach a trail starts which leads south to the cave. Its about 1km walk. 1967 beginn of excavations by Professor T.W. Jacobsen, Professor of Classical Archaeology and Classical Studies at Indiana University. 2013 developed with EU funds. Image: the cave is a through cave, almost a natural bridge. 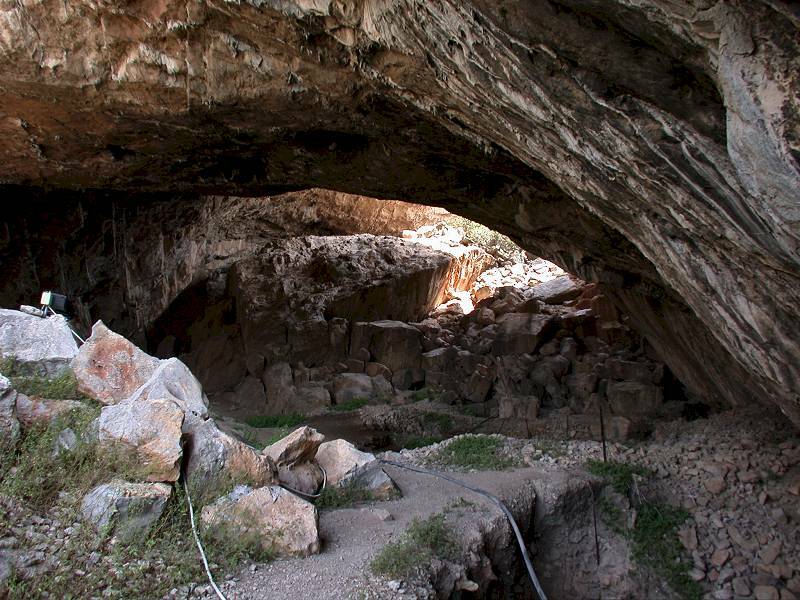 Frahthi Cave is a very important archaeological cave: it is one of the most important Stone Age sites in Greece. Here is the only good evidence for a continuous sequence of habitation. The earliest evidence is possibly 35,000 B.C. (Upper Paleolithic). Better evidence begins ca. 20,000 B.C. (Middle Paleolithic). The latest finds are from 3000 B.C. (Final Neolithic). 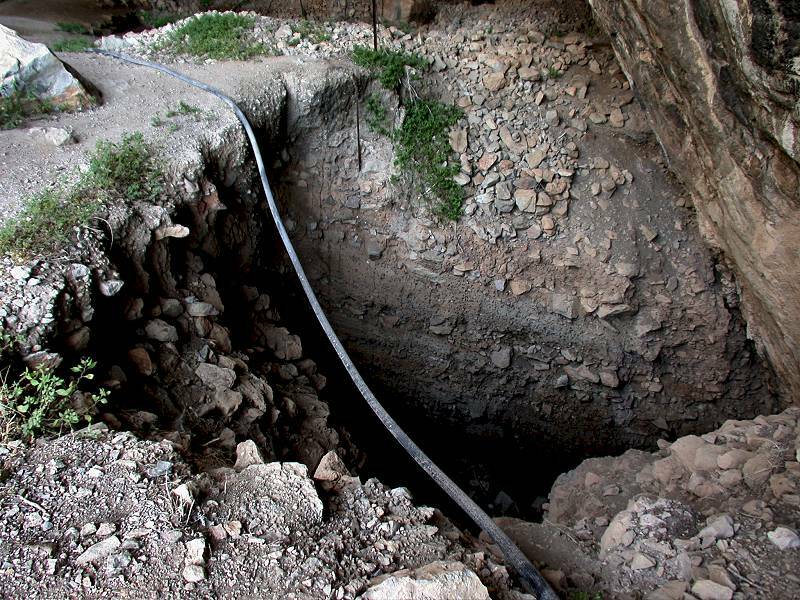 The excavations in the cave left several trenches, the deepest one is 11 meters deep, another one 9 meters deep. After the excavation they were not filled in, so you can still see the work of the archaeologists and the profile of the cave sediment. 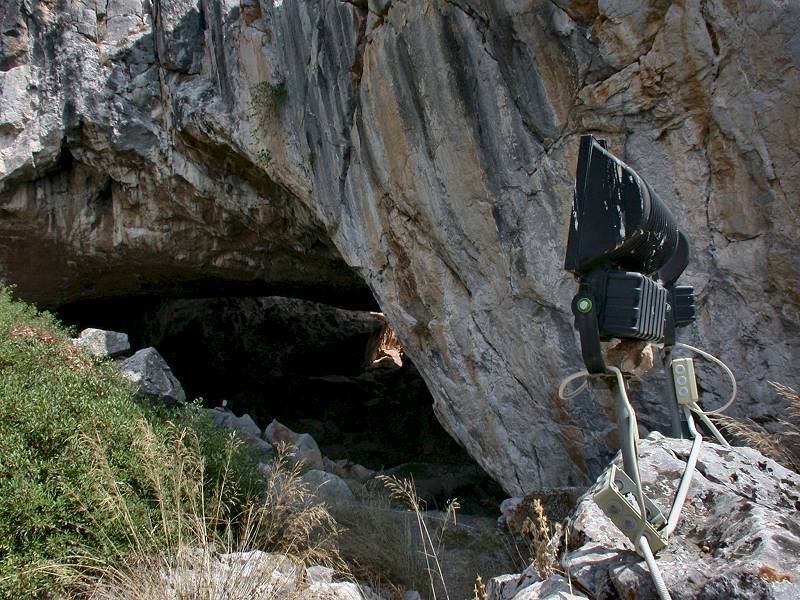 The number of publications on this cave is impressive, it is said to be the most thoroughly studied stone age site in southeastern Europe. And it was discovered more or less accidentially. Professor T. W. Jacobsen, Professor of Classical Archaeology and Classical Studies at Indiana University started the excavation in 1967. He did this only to fill some time, while land use issues at a nearby site were solved. But soon he discovered that this site was much more interesting than expected. Actually it is one of the very few settlements in the world that shows nearly continuous human occupation for such an extended period of time. 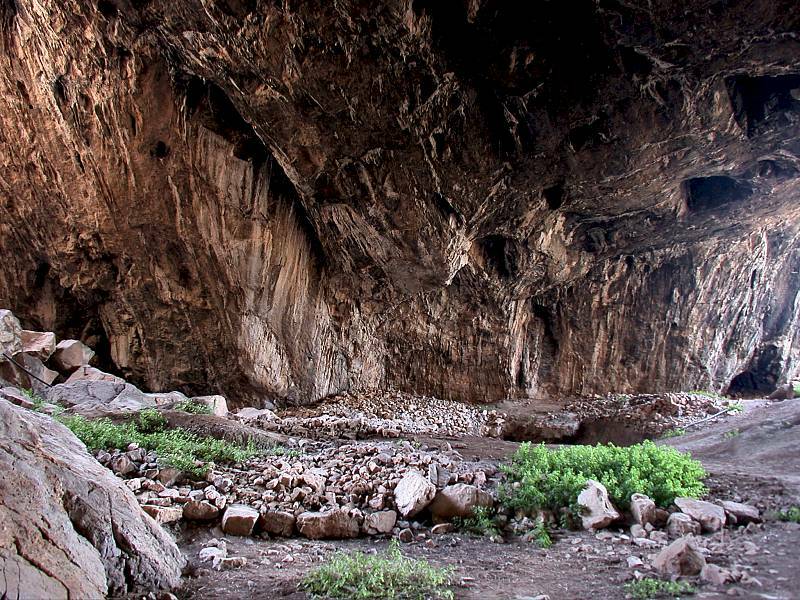 To reach this cave requires a short hike. You can drive by car to the beach near Paralia Fournon, which is mostly frequented by locals and has no infrastructure. But there is the possibility to park the car, and then walk along the shore to the left. 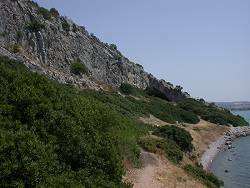 The coastline is rocky, with a small cliff, then a steep slope follows which ends at the foot of a second, much higher cliff. 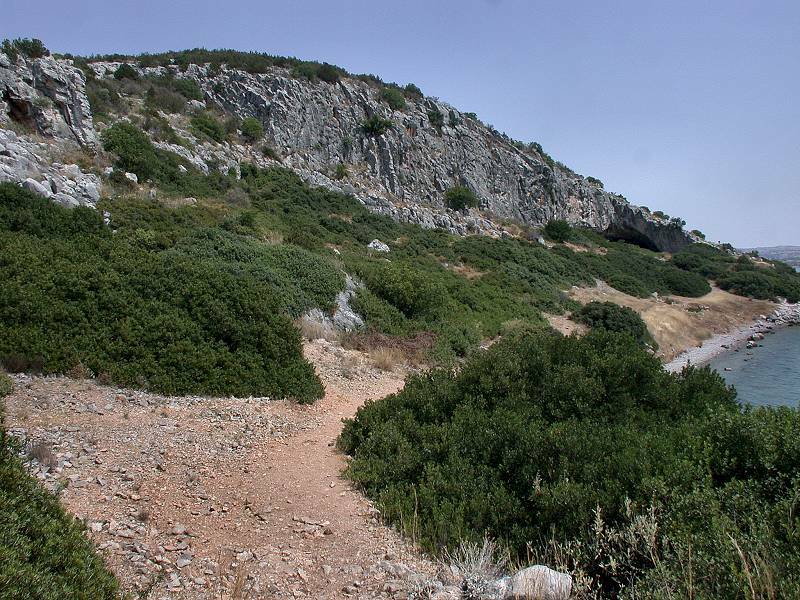 The trail follows the slope about 20m above sea level. Before you reach the cave, there is a landing place for small boats, so it is also possible to reach this place from Koilada on the other side of the bay by boat. However, there is no regular boat connection, so it is much better to walk to the cave. At least the cave is important enough to be illuminated during the evening. There are huge floodlight which are directed to the cliff face with the cave entrance, obviously to be seen from the town on the other side of the bay. The cave itself is quite impressive. Though only a ruin, it has two huge portals and a short but spacious piece of passage. This is a through cave, where light from both sides falls into the cave and there is no dark part of the cave. As a result it can be visited completely without lamp, although we nevertheless recommend one if you want to have a look into the archeaologic excavation trenches. 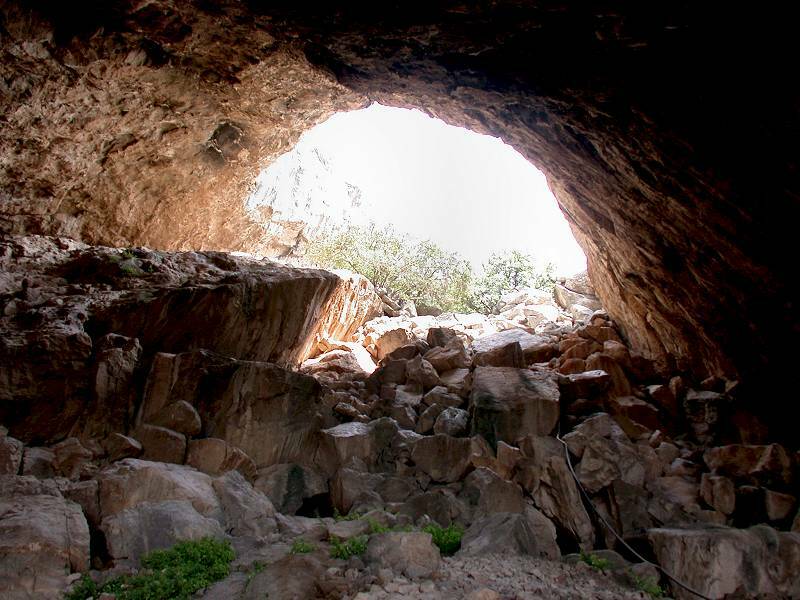 Until 2013 the cave was completely undeveloped, the trail was just a rough path used by goats and sheep. Then the cave itself was developed with wooden paths and metal railing, which was a very good idea. It protects both the visitors and the site. We have not visited the cave since then but we guess it is still accessible. The name of this cave is mysterious, sometimes it is written Φραξθι, sometimes Φράγχθι. There are even more transliterations, but it seems the most commonly used are Frahthi and Franchthi. Franchthi Excavations: 17,000 Years of Greek Prehistory, a detailed page about the excavations. William R. Farrand, T. W. Jacobsen (1999): Depositional History of Franchthi Cave, (Sediments, Stratigraphy, and Chronology): Fascicle 12 (Excavations at Franchthi Cave, Greece) Indiana Univ Press, 150p, ISBN: 0253213142.